Nowadays, it's become a common thing to share our life experience through blogging. Such as personal experience, make money experience, love experience, etc. Yes, blog is not only as personal daily story sharing media, but also as make money online media. That's why, women can work from home just by sitting down in front of laptop. They can make money online from designing, promoting product, reviewing product etc. Well known as work at home mom or stay at home mom. 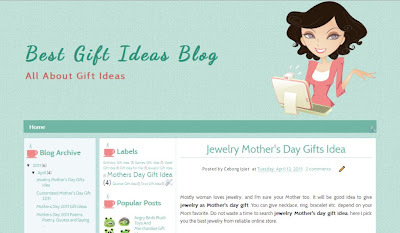 Now you can start or even redesign your own blog, by this Stay at Home Mom blogger template. I choose turquoise color, soft but elegant and suitable for Mommy blog. I think the main thing of work at home is laptop, so I choose woman with her laptop as header blog graphic. It simply to apply, please click download link. Upload it from your dashboard. If you want to use Work at Home Mom blog logo, you can save this logo below. Upload it through Page Element, click on Page Header gadget. Ensure to choose Instead of title and description when upload it. I love everything about this template. I have been trying to find someone or any easier program to make a avator or character "like the Mom" that looks like myself. As more personal blogs are starting to have these cute characters. Any info you are able to share with me. Would be greatly appreciated. Hello I love this template and I've succesfully installed it, but I can't get the date of the posts to show up! I've gone to page elements, and then 'blog posts' and told it to add the date, but it just doesn't show up. Could you please help, because it's turning out to be problem. Thanks so much!!! It worked! You made my day! Hi, here I am again: I would like to show the 'share button' at the bottom of each post. I've gone to Page Element, then to Blog Posts, and added them but they don't show up. Am I doing something wrong? Could you please help? Hi! I successfully added this template yesterday morning and it worked great. But in the afternoon, I lost the images like the girl at the top and the coffee mug in front of each element... Can you help please? Hi, could you please respond? I need to get it fixed or I'll have to change my template... again. Hi. Having the same problem. Are the images going to reappear or do I have to get a new template? Love this one and don't want to have to change it. Hi! I'm using the template but the images have suddenly disappeared. What happened? It is good to know that is another person how know haw to do a home business. Continue good work you do. yay!...sukses....thank you so much for your superb design. visit my blog ok. tq. pandora bracelets along with expensive jewelry are usually pandora bracelets canada the far more well-known charm jewellery pandora charms cheap within the industry these days. piece of pandora jewelry ones own lure could be the capability to mix and match these pandora bracelets sale coupled with spacers, to possess a quite a lot of visual appeal when it comes to various pandora bracelet parties. The best job ever when you are at home working. you can do it with your pajamas and slippers and you don't to worry for the money that you have to spend on fuel and other things. Blogging is the best thing ever. I can literally live with that. Cool update! Hello , i really like this template thanks! !But i want know how i can put the comments under the post??' When people visit a blog they leave the comment after they have read the post...hum...! yeah, nice template. ;) thanks for giving it free! How To Fix Auto Readmore On Post Pages?